A matched formula is a CNF formula whose incidence graph admits a matching which matches a distinct variable to every clause. We study phase transition in a context of matched formulas and their generalization of biclique satisfiable formulas. We have performed experiments to find a phase transition of property “being matched” with respect to the ratio \(m/n\) where \(m\) is the number of clauses and \(n\) is the number of variables of the input formula \(\varphi \). We compare the results of experiments to a theoretical lower bound which was shown by Franco and Van Gelder . Any matched formula is satisfiable, and it remains satisfiable even if we change polarities of any literal occurrences. Szeider  generalized matched formulas into two classes having the same property—var-satisfiable and biclique satisfiable formulas. A formula is biclique satisfiable if its incidence graph admits covering by pairwise disjoint bounded bicliques. Recognizing if a formula is biclique satisfiable is NP-complete. 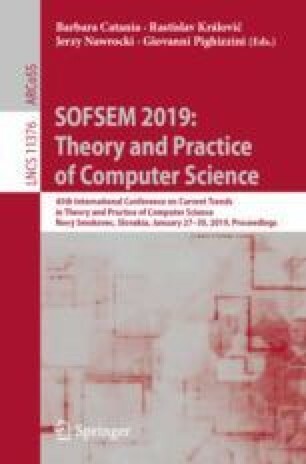 In this paper we describe a heuristic algorithm for recognizing whether a formula is biclique satisfiable and we evaluate it by experiments on random formulas. We also describe an encoding of the problem of checking whether a formula is biclique satisfiable into SAT and we use it to evaluate the performance of our heuristic. This research was supported by Charles University project UNCE/SCI/004 and SVV project number 260 453. Access to computing and storage facilities owned by parties and projects contributing to the National Grid Infrastructure MetaCentrum provided under the programme “Projects of Large Research, Development, and Innovations Infrastructures” (CESNET LM2015042), is greatly appreciated.